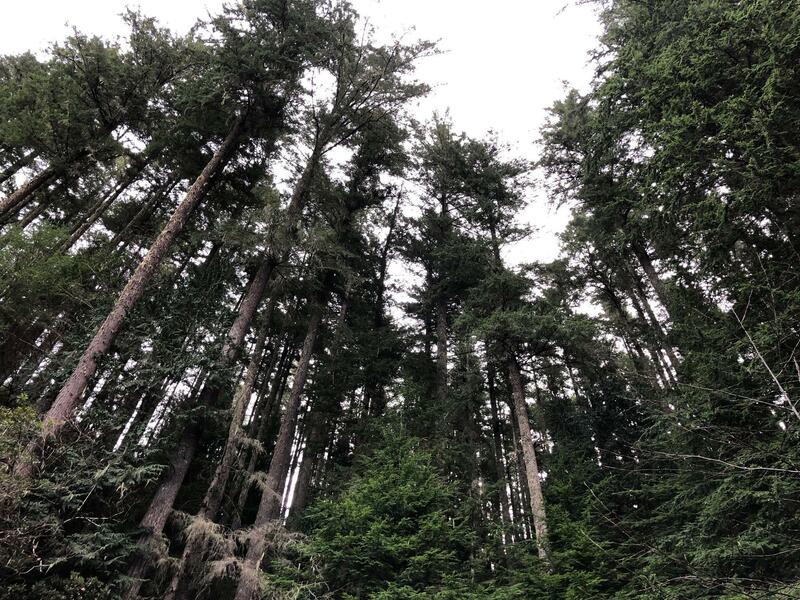 Trees in the Coquille Forest. The tribe has roughly 5,400 acres in 14 different parcels. Just over a year ago, President Trump signed the Western Oregon Tribal Fairness Act. It restored roughly 18,000 acres of federal land to the Cow Creek Band of Umpqua Indians, and 15,000 acres to the Confederated Tribes of Coos, Lower Umpqua, and Siuslaw Indians. The act gave both tribes a land base for the first time since their tribal status was restored in the 1980s. Helena Linnell (left) and Darin Jarnaghan (right) at the Coquille Forest. Linnell is the Coquille Tribe's Biological and Planning Operations Manager, and Jarnaghan is its Director of Natural Resources. It gave the Coquille Tribe something, too. Darin Jarnaghan, a Hupa Indian who serves as the Coquille’s Director of Natural Resources, explains as we drive towards the tribal forest west of Roseburg. “For the Coquille Tribe, the law allowed the tribe to seek management according to their own vision," he says, shifting his hands across his pickup's steering wheel. That plan has been in effect since 1994. 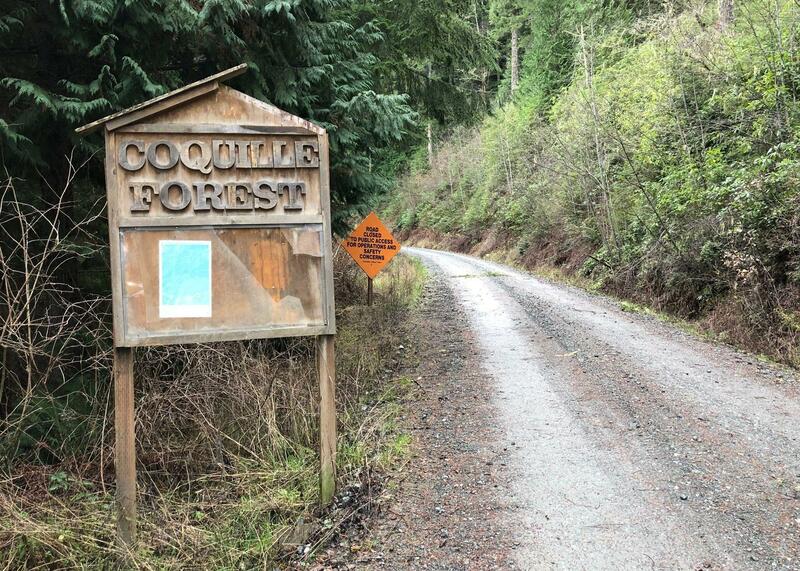 While federal forest policies have their part in conservation efforts, Jarnaghan says being allowed to self-manage recognizes the Coquille’s sovereignty, and address issues unique to the tribe. Unlocking the gate to the 5,400 acre Coquille Forest, he explains what those are. “Speaking just for the Coquille Tribe, the tribe wants to make sure that members have access to historically what was here on the landscape, and what was managed historically for the tribal purposes," says Jarnaghan. Gated entrance to the Coquille Forest. 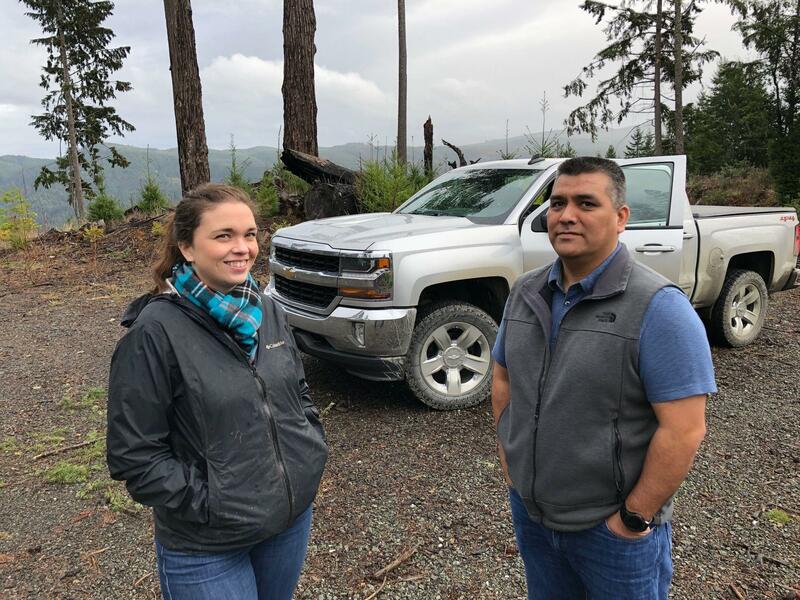 About four hours’ drive north, Michael Wilson, Natural Resources Manager for the Confederated Tribes of the Grand Ronde, visits part of the roughly 14,000 acres under tribal management northwest of Salem. “Yeah, these trees over here are probably, good 70 years old," he says, navigating through brush and mud. Michael Wilson, Director of Natural Resources for the Confederated Tribes of the Grand Ronde, on part of the tribe's acreage. Wilson says compared to forest land managed by timber companies, tribal forests tend to have more diversity in their trees and plants, which includes huckleberries and hazel…traditional food and basket-weaving materials, respectively. Trees are thinned to accommodate foraging areas for elk and deer. Brush is cut by hand instead of using aerial herbicides, and prescribed burns control slash and enable certain growth that benefit the ecosystem. 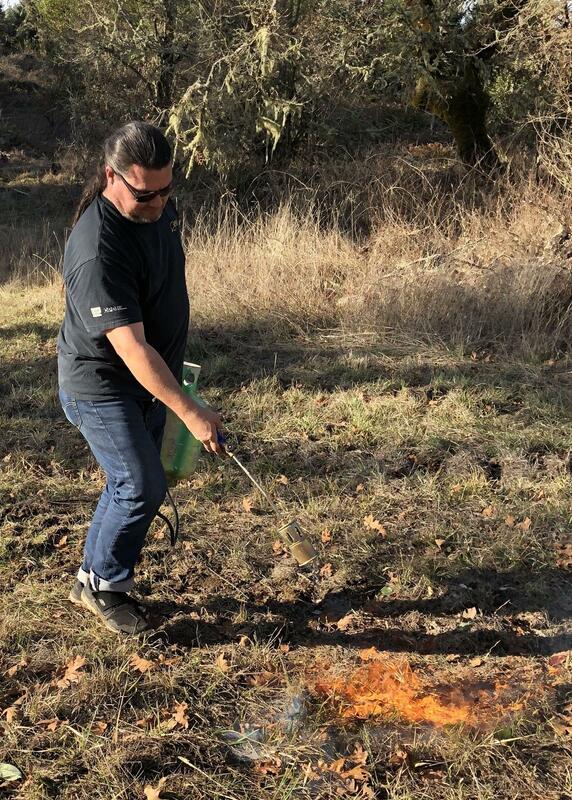 Joe Scott, of the group Long Tom Watershed Council Team Traditional Ecological Knowledge (LTWC TTEK) conducts a prescribed burn at Reasoner Refuge near Eugene, Oregon. Driving by forest land that borders the reservation, Wilson points to a ridge that’s been clear cut by a timber company. He says there’s profit potential in many old growth forests both on and off the reservation. “Y’know…$350, $500, depending on which tree," he says, slowing to make a turn. "Some of the bigger ones, $800. You start adding those up, it’s a lot of dollars. 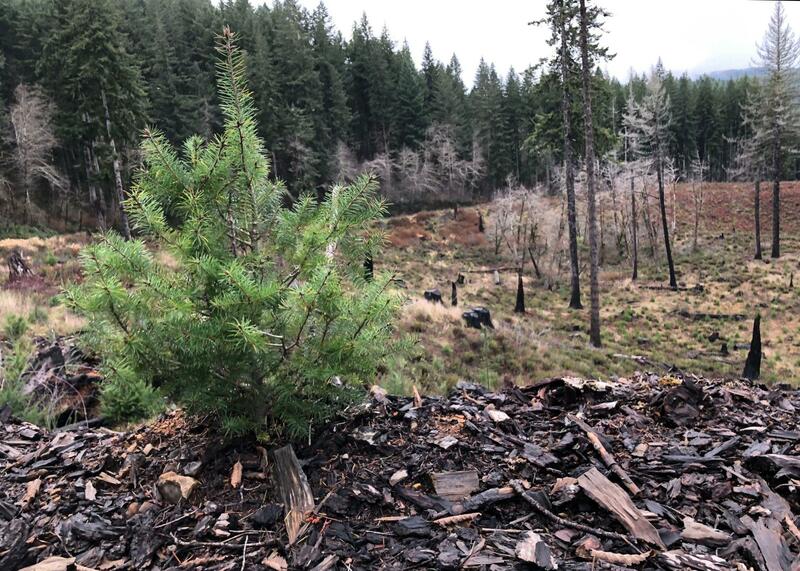 In many of Oregon's tribally-managed forests, young growth mixes with old growth, with areas cleared out for elk and deer foraging sites, as well as plants important to Native Americans, including huckleberries, hazel, and camas. Right enough to get recognition, says Don Motanic, of the Intertribal Timber Council based in Portland. He says independent, 10-year assessments of tribal forests compared to federal forests have highlighted two major differences to Congress. “One is that tribal forestry programs function at one-third of the cost as compared to the Forest Service," says Motanic. "It’s $9 an acre for the Forest Service, and $3 an acre for tribes. And a 2009 study by the Property and Environment Research Center (PERC) compared timber returns between the Lolo National Forest and the Flathead Indian reservation in Montana. 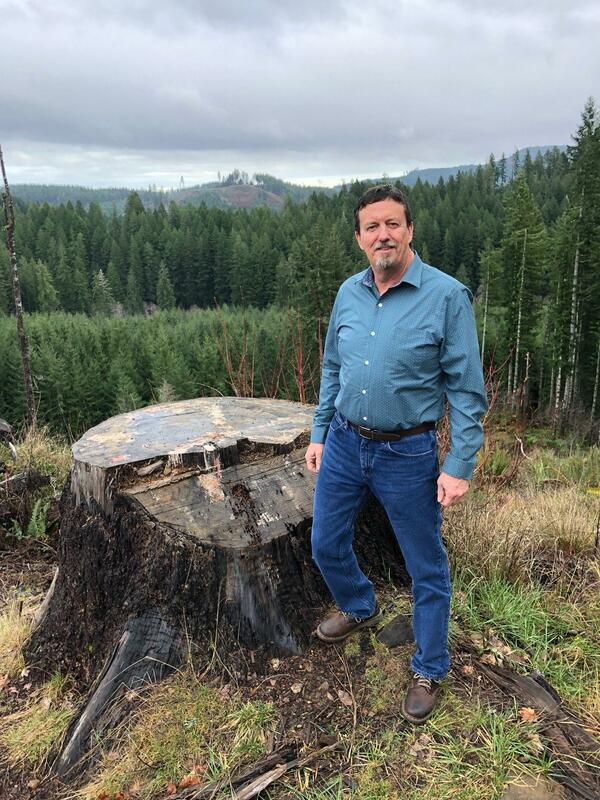 PERC’s finding was that over a seven-year period, tribal timber revenues exceeded $16 million, nearly seven times more than that managed by the U.S. Forest Service. “The key thing is knowing their own land, and understanding their language,” adds Montanic. 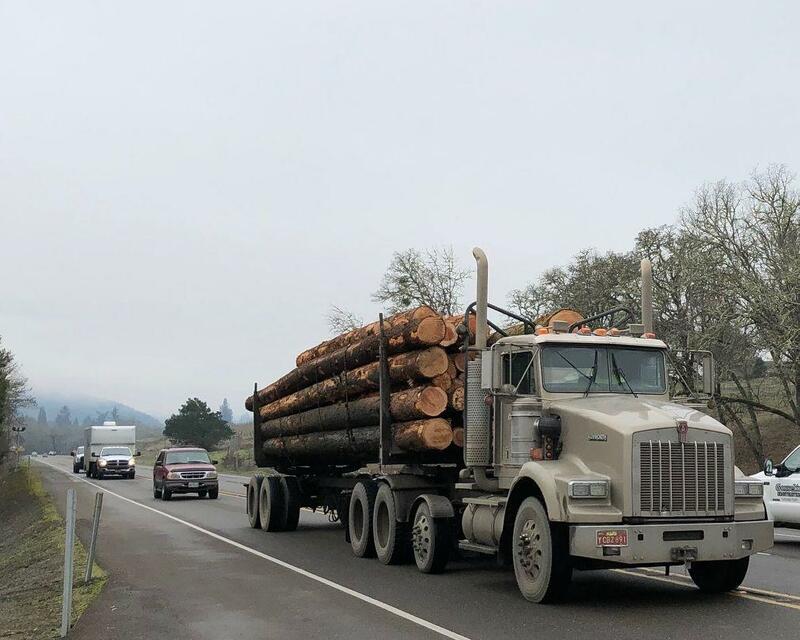 A logging truck headed eastward on Highway 42, near Brockway. Motanic says unlike timber companies, tribes don’t up and move once an area has been harvested. The land is part of the tribe and its culture, and is managed for the sustenance and appreciation of future generations…not solely for the bottom line. Familiar challenges exist: invasive species, diseases, and climate change threaten tribal forests as any other. 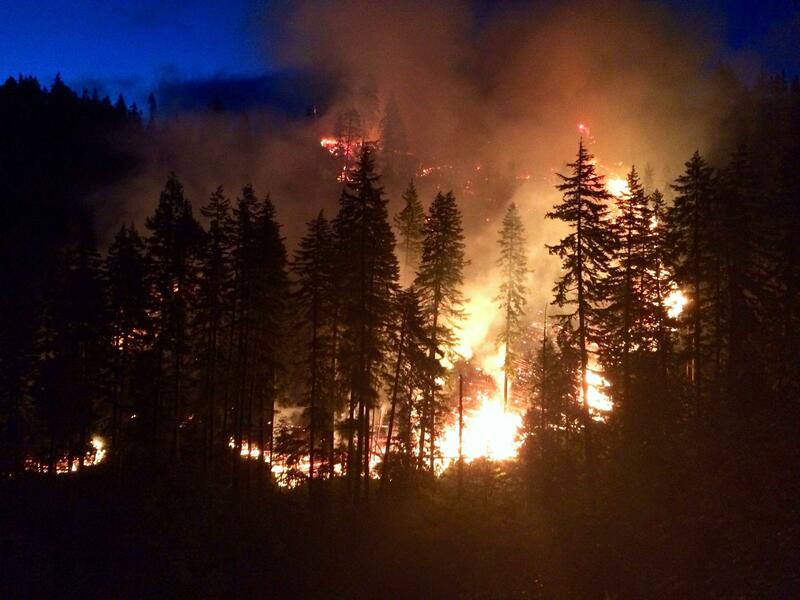 Helena Linnell, the Coquille Tribe’s Biological and Planning Operations manager, says wildfires are especially worrisome. 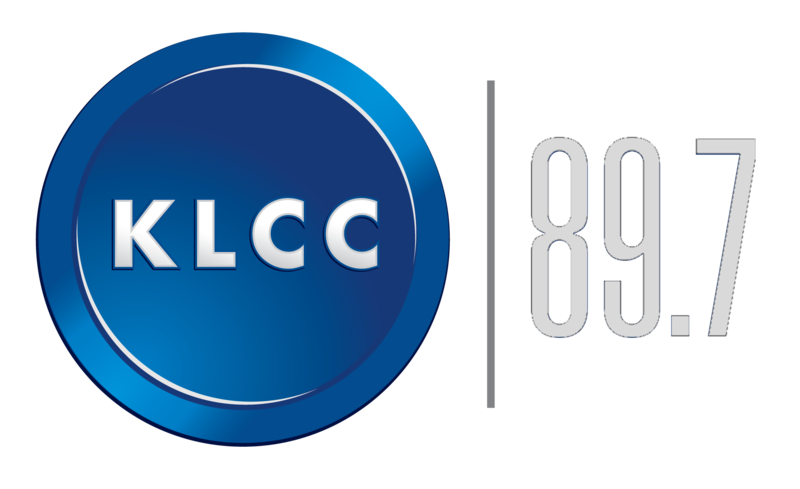 “They seem to be lasting longer, they don’t stick to their traditional timeframes," Linnell tells KLCC. Partnerships are budding. Last July, the Forest Service formalized a plan with tribes near the California-Oregon border for managing the Klamath region. Controlled burns will help remove fuels and kill pests like weevils, while allowing new shoots of hazel to grow. And legislatively, tribes have never been in a better place. Besides the Western Oregon Tribal Fairness Act, the latest Farm Bill has tribe-friendly provisions…including one that’ll let tribes set up self-governance demonstration projects to manage federal lands adjacent to Indian reservations. For Coquille natural resources director, Darin Jarnaghan, it’ll all help share tribal perspectives. Funding for KLCC’s “Borders, Migration, and Belonging” series is provided by the Wayne Morse Center for Law and Politics at the University of Oregon. The federal government is failing to meet its obligations to Native American tribes, according to a new report from the U.S. Commission on Civil Rights. As KLCC’s Brian Bull reports, the shortcomings affect many major areas for tribes, including those in Oregon. Oregon's Native American tribes are well known for their casinos. What's less recognized is how tribes use their sense of place to start new businesses, and the diversity of those ventures. Oregon’s Native American students largely struggle to keep pace with their non-Indian peers. Graduation rates and attendance are low, while dropouts are high. In this months’ segment for the series, “Native Voices of Oregon” KLCC’s Brian Bull talks to Indian educators about the challenges their students face, and what’s being done to brighten their prospects. The term “Two Spirit” in Native American culture often describes a person possessing both male and female spirits. And they’ve been around well before the Santa Maria or the Mayflower dropped anchor. And while “Two Spirit” has been used for Indians who identify as gay, bisexual, or transgender…many say there’s more to it than that. KLCC’s Brian Bull explores a community that’s finding its voice again after generations of oppression, prejudice, and oversight.